ETA: Unfortunately we no longer carry the Create-a-Cut and I do not know where it is that you might find it. Thank you so much for your interest. At last – the information you have all been so patiently (or perhaps impatiently) waiting for me to share. Pictured below is the new cutter I have recently acquired – I did not want to share it with you until I knew for certain that I really, truly did love it! I thought I would, but I’m a cautious individual when recommending tools and I had not had enough time to experiment with it and give you as much information as possible, before I start selling these online. Now that I have had the opportunity to play with it… well, I’m so thrilled with the little “Paper Flourishes” that I have been able to create. Please look in earlier posts for several of the cards I have made featuring the "Flourishes" I created using this cutter. Please let me know what you think – I would love any and all feedback, criticism, whatever! The Create-a-cut™ is made by Made Easy Incorporated®. Most people want to know how much it is going to cost before they even tempt themselves – so here it is – I will be selling the Create-a-cut™ with it's three blades for $109. The second option is the Create-a-cut™ Kit. 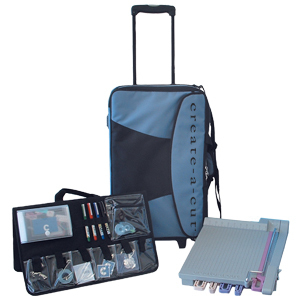 This kit includes the Create-a-cut™, an additional blade (small wave), an accessory tote and a carrying case on wheels. This kit sells for $179. The Create-a-cut is warranted against defects for one year after purchase. Made Easy Inc. will service or replace any defective or broken part without charge on the condition the damage has not resulted from improper use. I have the create a cut, but one of the blades got bent while trying to cut the paper. Do you have happened to know where can I purchase the extra blades. I would really luv one of these. Please send me some info, thanks. 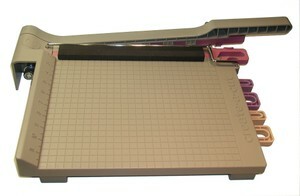 Hi - I am interested in purchasing the Create-a-cut paper trimmer. How do I do that??? thanks. Love that you'll have this in your store! I'll have to wait until I move back to Florida and have more room...can't wait!!! Uh oh... Don't ask me why I thought that I could look at a blog and not spend money. I see sooooo many things I really NEED. I go out of my mind (which is not very far, LOL) trying to cut long edges with scalloped scissors. I start larger than I want the finished item to be and by the time I get through cutting to get the corners rounded evenly it's too small. Can you get the scallops to come out properly at the corners? If you can put me down for one.